America is shocked, shocked! Kermit Gosnell, a 69 year old abortion doctor, was arrested last week, charged with killing seven babies and causing the death of a woman during a botched abortion. An illegal, late-term abortion. Prosecutors are accusing Gosnell of using scissors to snip the spinal cords of seven babies who were inconveniently born alive. As Americans gasp in horror over the sordid details of killing living babies and tossing them in the trash, our President is wining and dining a man who is responsible for enabling thousands of Kermit Gosnells. I refer to Chinese President Hu Jintao. And China’s 40 year-old policy, yawn, of forced abortions. In the early 80’s, China decided they had to cut down on their burgeoning population. They instituted a “one-child” policy, decreeing that no woman was allowed to have more than one child. In order to enforce this draconian policy, every village in China appointed a population control officer, whose responsibility was to enforce this rule. If a woman was caught trying to have more than one child, the penalties ranged from economic penalties to burning down her house. If the woman persisted in giving birth, her whole village was penalized. Steven Mosher of the Population Research Institute is the only living American witness to this forced abortion policy. Living in rural Guangdong in 1980, Mosher viewed (and documented) the killing huts — the huts where 9-month pregnant women were forced to go in order to have poison injected into their wombs. The women had to wait in these huts 24 hours, or until the poison forced the baby out of her womb. If the baby was alive, it was placed in a pail of boiling water. Others were placed in an airtight jar. One particularly zealous doctor, Dr. Yin, induced premature labor. When the baby crowned, he would inject pure formaldehyde through the fontanel directly into the babies’ brain. Other babies inconveniently born alive were tossed into a pile, where they cried for many hours before finally taking their last breaths. China practiced varying methods of abortion and prevention to find the most efficient way to destroy these unwanted babies. And they were successful. It has been estimated that 1.7 million female babies “went missing” every year, through abortion and/or murder by parents who needed a boy baby to take care of them in their old age. This policy does not stop at China’s borders. Chin An (not her real name), the population control officer of a small village whose story was chronicled by Mosher in A Mother’s Ordeal , was granted a visa to join her husband in America. She then found that she was pregnant. Having already had her quota of one child, she found that, even in America, she was being watched by Chinese agents, who informed her that her family in China and all the workers in the factory she used to work in would be punished if she had this second child. Obama told the American people that there has been “evolution” in human rights in China over the last three decades, saying China is willing to have a dialogue on the issue on the basis of mutual respect and non-interference into China’s internal affairs. Translation: China has warned America, once again, to keep its nose out of China’s business. As for the “mutual respect,” it appears the respect is only one sided. Compounding the lack of respect portrayed by China, the Chinese pianist at the state dinner played a tune that all Chinese recognize as encouraging hatred of the United States as the enemy of China. Obama wasn’t even aware that he was being portrayed as a fool for displaying such fawning deference to a man who was blatantly disrespecting him for all the world to see. 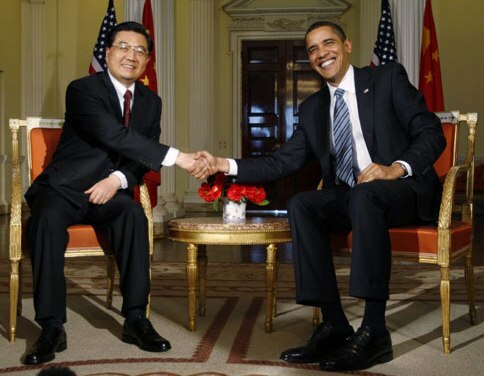 Instead, our president appears to agree with Hu Jintao. Last week, Obama acknowledged the decline of US dominance. He then went on to welcome China’s rise on the global stage. And no wonder. China is a model Obama would have America emulate. Time Magazine posted a fawning article about the new model of “state capitalism” being practiced in China. Holding it up as a model for America. Based on his own writings, Obama would dearly love to implement China’s policies here in America. In China, citizens are forced to place fealty to the state over fealty to God. In China, the state rules with an iron hand, and those who dissent are silenced. No need for national conversations on vital issues. No Fox News or Glenn Becks. No pesky Christians advocating morality and adherence to God’s word. Just absolute obedience to the state. In all things. This is the utopia the left yearns for. This is the path Obama wants America to take. A path strewn with the dead bodies of babies, dissidents and anyone who dares question the supremacy of the divine leader. Americans beware. And to all you young Americans who dream of having large families, you’d better hurry up. I have no doubt that your evaluations of current feelings and trends are spot on. I also have little doubt that many will try to argue that forced abortion and voluntary abortion are two different issues. What is the bigger sin, state forced abortion or state approved abortion? The desired out come is the same isn’t it? Murder of the unborn is the ultimate human rights violation. The rise of China in world wealth and power is mostly due to the free trade legislation enacted with the help of both Democrats and Republicans. How much “cheap Chinese junk” are we willing to forgo in order to precipitate (maybe and only slightly) some human rights reforms in China? We have known about many of the very offensive things happening there for years; yet we buy, I understand increasingly, their stuff because we want to. It is ubiquitous. Can I reasonably anticipate some boycotts? How about telling our bankers we no longer want their money? Speaking as one who is pro-choice, as a matter of practical policy, I agree that the case of Dr. Gosnell is horrific. He should spend the rest of his life in prison. Late-term abortions are bad to begin with, but what he did was unambiguously murder. Based on his own writings, Obama would dearly love to implement China’s policies here in America. … This is the utopia the left yearns for. This is the path Obama wants America to take. A path strewn with the dead bodies of babies, dissidents and anyone who dares question the supremacy of the divine leader. There may be some handful of weird extremists who think like this, but it certainly doesn’t include the President and virtually all Democrats. I understand not liking liberals, Democrats, and Obama, but why go to such absurd extremes? Sometimes,I think you are joking,Nancy. Certainly you do not presume to speak for me or any other Democrat? Democrats do not condone any of these actions. We are outraged,as you are. We will continue to wine and dine the President of China,as long as we owe them so much money. We will continue to purchase their crap,because we do love cheap crap. We,as a people, love to hide our heads in the sand,when it comes to unpleasant truths about cruelty and evil. Ever wonder why no one ever sees inside a beef slaughter house? Never see slaughter houses on the news,we just can’t take the ugly truth, about human cruelty,all in the name of a hamburger. Not surprising,we look the other way,about Chinas’ one child policy. We all agree,there are entirely too many people there,but the way to fix it,doesn’t seem to be very humane or right. We need to find a better solution,though I doubt,we have any say, in the matter.